Oh what a difference a sunny day makes. 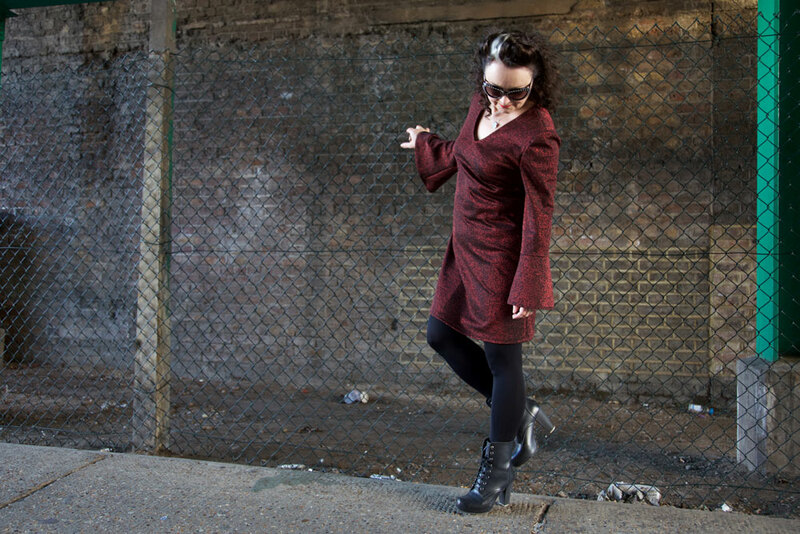 Meant I could withstand a shoot for a whole 15 minutes without a coat! And I’m so happy that Daniel could do them as he did such a fab job and I’m hopeless and impatient at the whole remote thing. 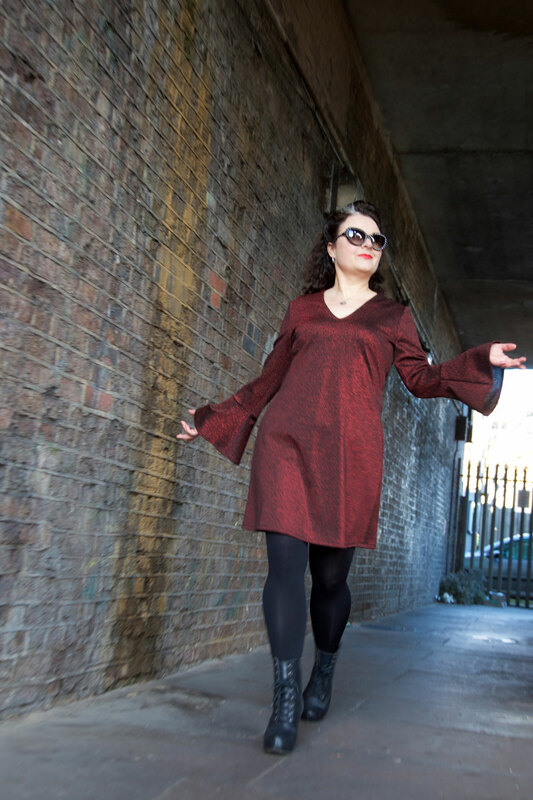 This dress is a bit late to the blog but was well on time for the party. 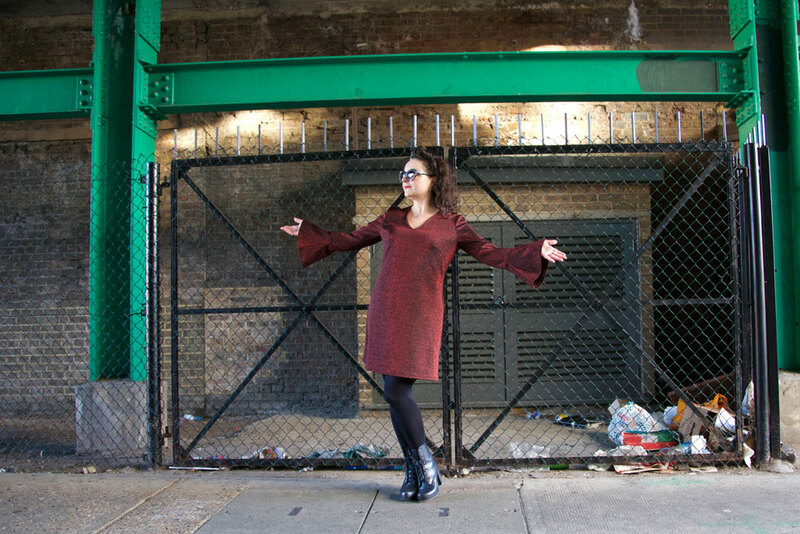 It’s the Burdastyle bell sleeve dress that I made for New Years Eve. I clearly had a bit of time on my hands because I made two of these up in the space of that week between Christmas and New Year. You can see my black glittery version in the previous blog post, here. 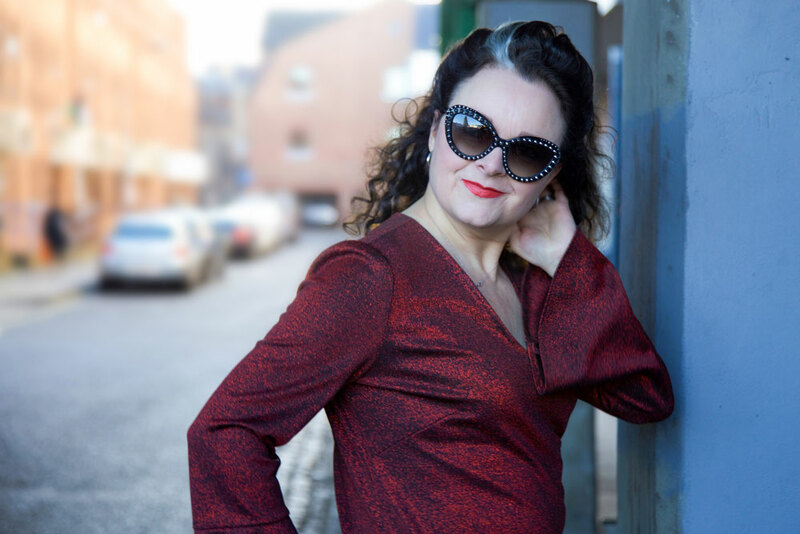 This one is way more glittery and more red and more suitable for a dance at the disco than mooch down the Marks and Spencer aisles but I think its very likely I’ll be breaking those kinda rules. The fabric doesn’t have as much stretch as the last one but I still managed to forgo a zip, just the same. It’s a lot less snuggly on account of the high metallic thread-count but that also means it doesn’t need an iron. I only tend to press seams during the making-of, these days and avoid at all cost those mum-style marathon ironing sessions in front of the telly. I’d sooner sew than iron! The downside of a fabric that won’t behave under pressure (and low heat) is of course the issue of pesky popping-out facings. I tacked them down at the shoulders and at the centre back seam and still they found an escape route. So I sewed by hand, tiny little stitches close to the neckline. It’s vaguely visible but way less annoying than flappy bits of fabric spoiling the picture! Because I was in a rush with this one, I didn’t overlock the seams. They are ‘pressed’ open. In the loosest sense of the word, lol. But the fabric isn’t ever going to fray because I tested that by giving it a bit of rough treatment and it remained calm and intact under pressure! The temptation is to make another 5 of these, so then I will have one for every day of the week. It give’s no grief to sew and it gets so many compliments in return for such little effort. 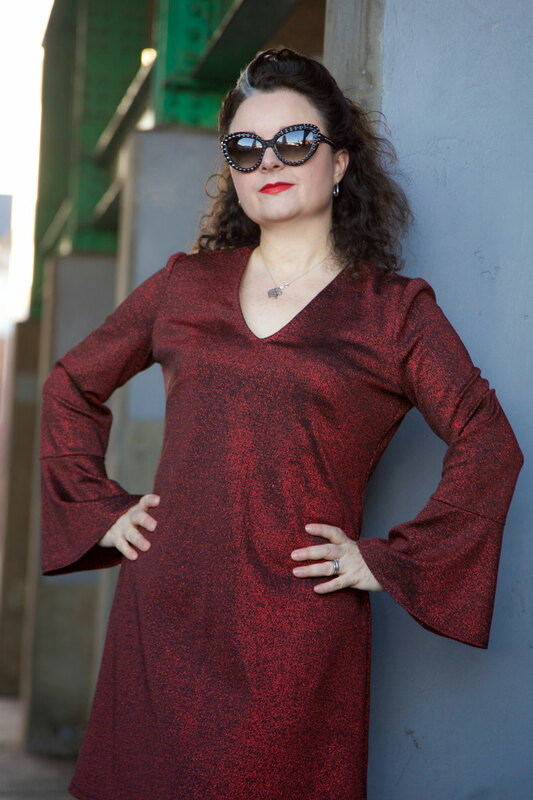 I haven’t really styled it much here but chokers, big floppy 70s hats, a neck-tie, a faux fur scarf or some massive earrings, could all transform this dress for a totally different look. I still might make another one at least, though! I’d like to make it in a woven – with a zip of course – just to test the difference. Happy new year my lovelies! I do hope you’ve all had a fabulous time and that January 2018 hasn’t arrived with too much shock to the system. Such a weird time of year this first week of Jan. My lead up to Christmas – probably much like everyone else’s – was a flurry of work and panic shopping, drinking and feasting to excess like crazy bear people and without so much of a sniff of sewing time, and then… it’s all back to normal. Or as normal as it gets. And now I’m left in a constant state of thinking I’ve forgotten to do something, or that I’m meant to be somewhere. And it’s really hard to to rein in the graze and remember to go for the tap and not the wine bottle. Sound familiar?! 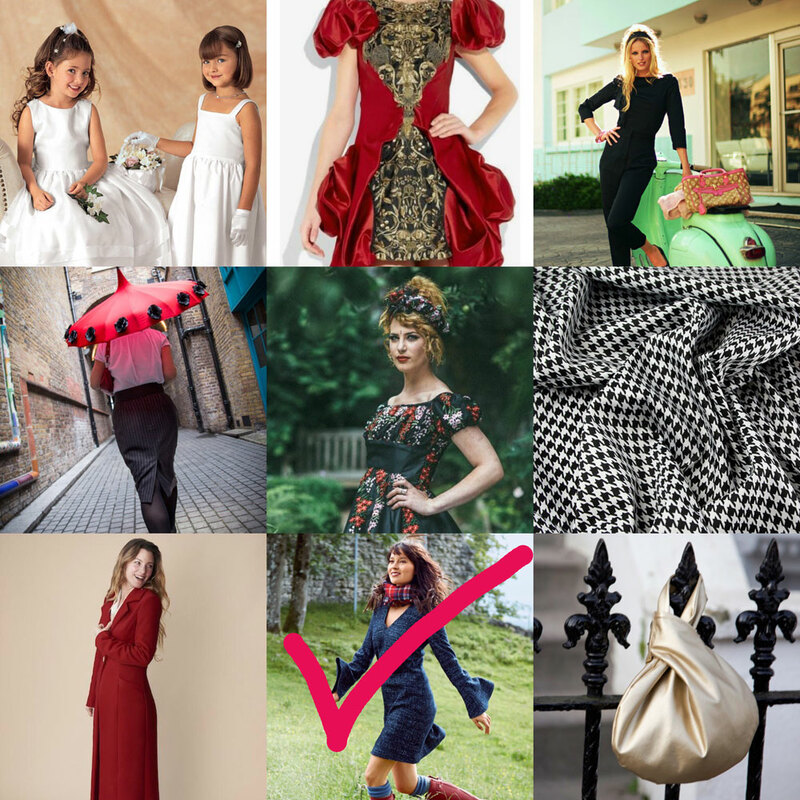 I awarded myself some sewing time between Christmas and New Year and the balance is still good so far, following week one in the work-house so I’ve signed up to Rochelle’s #2018makenine on Instagram – an easy enough challenge whereby we are encouraged to declare nine things we’d love to make throughout the year. And last night I managed to strike one of my intended projects off the list. Well two, actually, if the one I made for New Years eve counts! 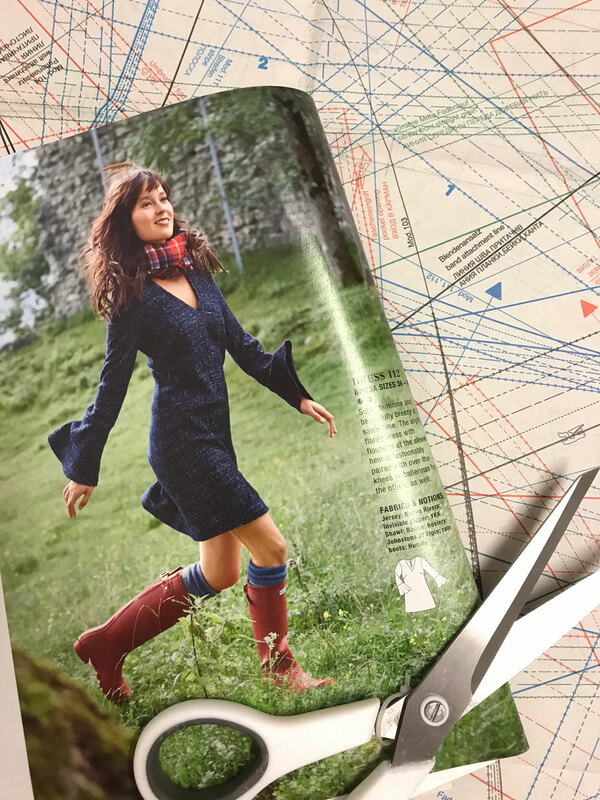 This dress a very gentle casual-style ease back into the sewing game kind of project: Burda Style Issue 12/2016 Bell-sleeve dress. 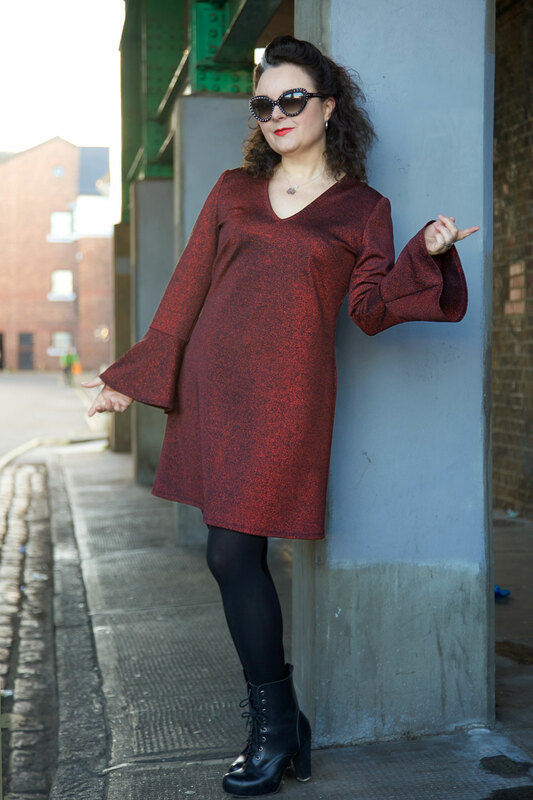 It’s been a long while since I made anything Burda and I forgot all about wanting to make this dress till I had a had a sort out of my magazine collection. I’ve been collecting them since December 2010. 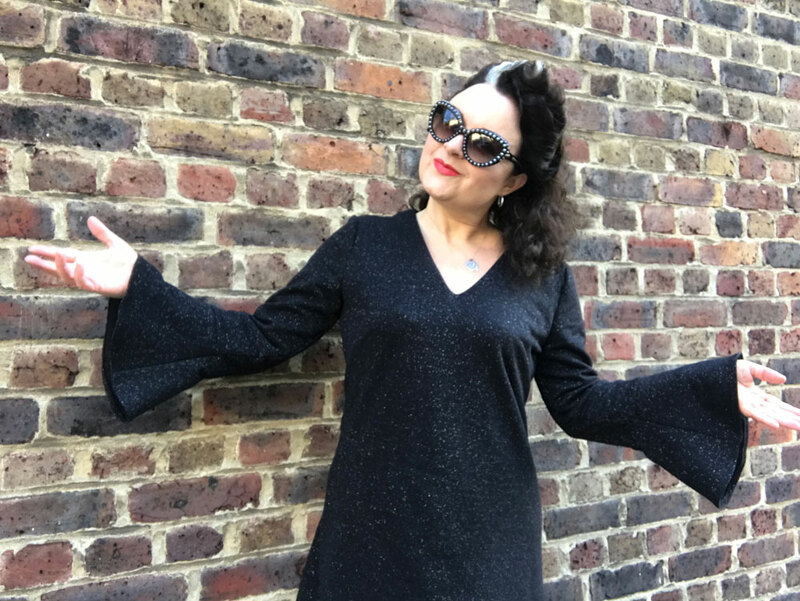 I’m sure it would be easier to search up what I wanted on the site and download the pdf pattern but I quite like that I always have the pattern already and don’t mind tracing it off too much. Especially when there’s not too many pieces involved. Really not very much to report on construction: A couple of bust darts and a neckline facing with a bit of understitching being the only faffs. And then my usual alterations. A sway back adjustment for one. So I just located the waistline and effectively took a horizontal dart 5cms from the back seam tapering to nothing at the side seam. It’s amazing how much of a difference this makes. I used a stretch jersey as recommended but was confused by the need for a zip. So I tacked the back pieces together to check the fit before I went and sunk those tiny stretch stitches into the fabric. It was a good bit of hindsight and proved that I didn’t need a zip at all so I hi-fived myself and stitched it down. The only other adjustment I made was to nip it in at the waistline a bit by marking in an inch and tapering back out to the side seams. Not too much of an issue as I was going to overlock a small seam allowance afterwards. 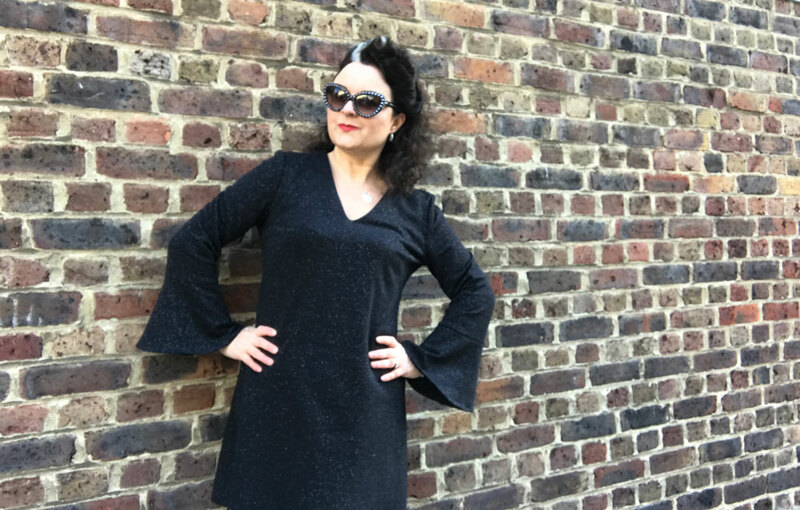 The fabric is a very soft, substantial jersey knit with a bit of glitter action so I can still carry a bit of a party round with me even though the season is done and dusted. The funnel sleeves are what sold me. 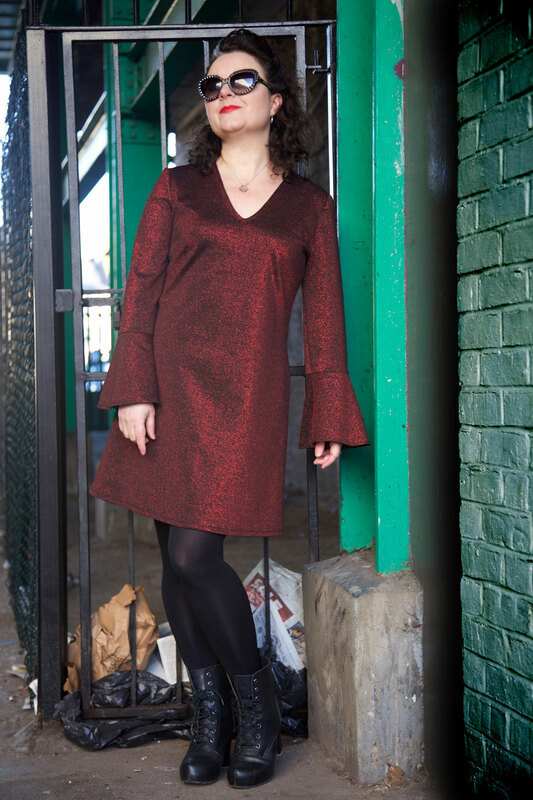 They add a bit of fun and create a great silhouette to what is otherwise a very simple V-neck dress. The flounce is added to the sleeve before sewing up the under arm seam and insetting. And not for the first time, I am so impressed with the perfect amount of ease Burda gets right on the sleeve cap every single time. Not a pucker in sight! 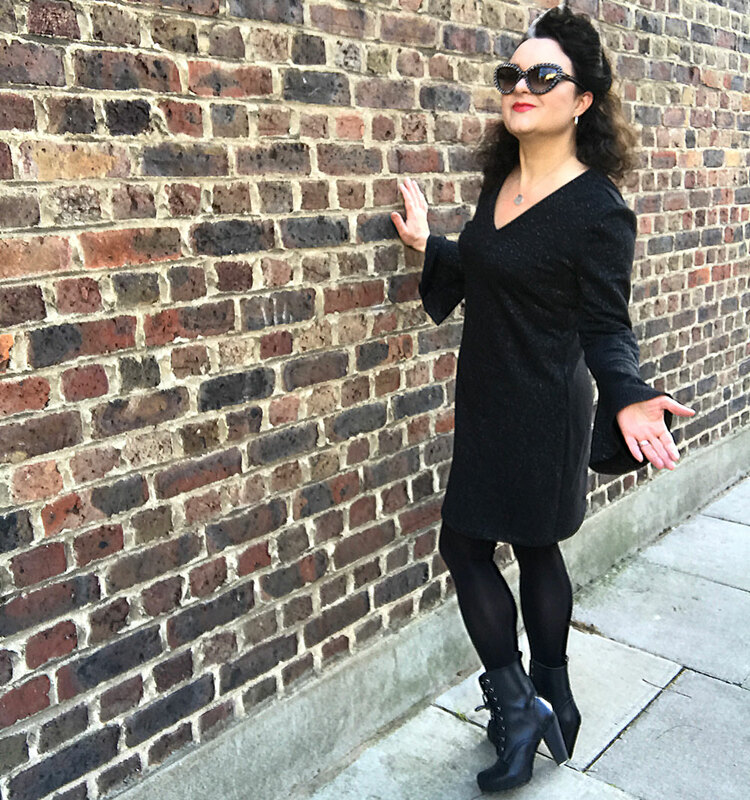 Well this dress has definitely filled a gap in the wardrobe: It’s perfect for work, 80 deniers and boots; worked great with a pair of Doc Martens (and a warm coat) for a river walk today and I’m sure a pair of heels and some twinkly earrings will transform it from a day to night-out dress. All bases covered! It really does feel so good to be back behind the machine. I was so busy with work leading up to Christmas that there was no time for sewing and I missed it so much. I’m hoping to cut into the next one on my list soon and keep up a bit of wardrobe re-stocking while I can.